Eliud Kipchoge says he wants to break the marathon World record again, before he retires. Speaking on Tuesday night after becoming the first marathoner ever to clinch the IAAF Male Athlete of the Year in Monaco, Kipchoge notes that it is his desire to leave the sport on a high and that includes lowering the record further. 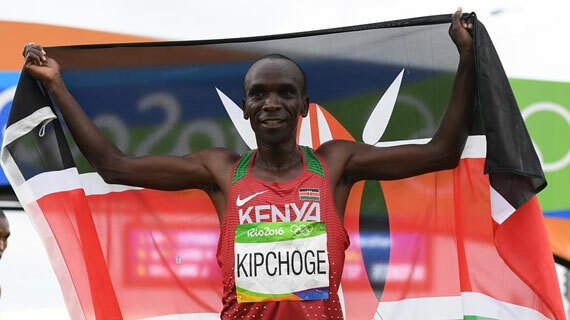 “It (world record) is breakable and I hope that one day again before I go out in the sport, I will make a good show and do a beautiful thing and try to break it,” noted Kipchoge. The Olympic champion became only the second ever Kenyan to clinch the IAAF award after David Rudisha in 2010 and was hugely impressed and delighted with his latest recognition. “I want to say thanks to the whole world for voting and those who contributed to my success. This award means a lot to marathon and it has further showed that it is true, Marathon is life,” Kipchoge further stated. In his acceptance speech, he went on to laud his family and coach Patrick Sang, saying they have been an integral part of his career. “My wife and kids are my ignition keys everyday I wake up to go to training. Secondly, I want to say thanks to my coach Patrick Sang. His training and coaching skills have uplifted my life in sports,” Kipchoge said. The 34-year old enjoyed a successful season starting off with winning the London Marathon and climaxing in his historic run to break Dennis Kimetto’s World Record, running 2:01:39 to clinch the Berlin Marathon crown.